Even as China struggles with the slowest pace of economic growth in years, Boeing is forecasting that the country’s aircraft fleet will almost triple by 2034. 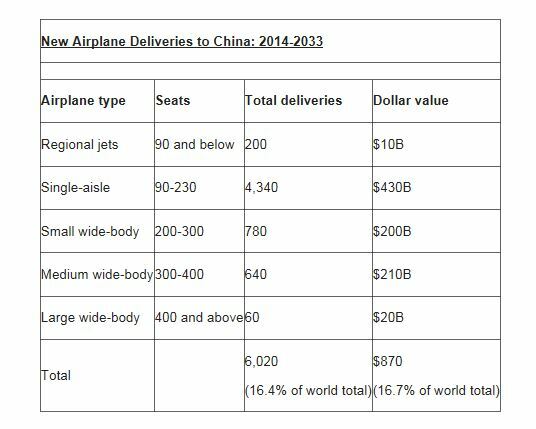 In its annual China Current Market Outlook released in Beijing on Tuesday, the American aircraft manufacturer projected a demand for 6,330 new airplanes worth $950 billion over the next 20 years. “Despite the current volatility in China’s financial market, we see strong growth in the country’s aviation sector over the long term,” said Randy Tinseth, vice-president of marketing at Boeing Commercial Airplanes. 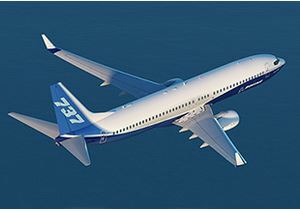 Boeing projected that the main growth would be in the single-aisle airplane (left) sector with a demand for 4,630 aircraft while the widebody (below) segment will require 1,510 new airplanes. Boeing also noted that Chinese airlines have more than doubled their long-haul international capacity over the past three years. “Enabled by China’s growing middle-class population, new visa policies and the underlying strength of its economic growth, this expansion is expected to continue, and in fact accelerate,” Tinseth said. Boeing, which dominates the Chinese skies, is projecting a demand in the country for more than 6,000 new airplanes over the next 20 years, valued at US$870 billion. The American airplane manufacturer’s annual China Current Market Outlook released in Beijing on Thursday shows Chinese airlines will take delivery of nearly 45 per cent of the total demand for airplanes in the Asia-Pacific region during that period. “China’s aviation market is going through dynamic changes,” said Randy Tinseth of Boeing Commercial Airplanes. More than 50 per cent of all commercial jetliners operating in the country are Boeing airplanes, the company said. It also noted that China is a major contributor of parts to Boeing.